I offer Bupa customers standard cataract surgery on the Full Pathway package option at New Victoria Hospital . Mr Shanmuganathan undertook his undergraduate training at the United Medical and Dental Schools of Guy's and St Thomas' (UMDS), now King's College London. He qualified in 1995, having been awarded the Lord Riddell Prize for Surgery. He started his ophthalmic training in 1998 working in a number of ophthalmology departments across the UK and abroad. Following the completion of his ophthalmic medical training, he undertook a further two years of sub-specialist fellowship training in cornea and external eye diseases at Moorfields Eye Hospital. 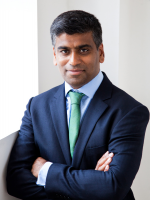 Thereafter, Mr Shanmuganathan was appointed a Consultant Ophthalmic Surgeon at Kings College Hospital NHS Foundation Trust. In 2017, he took up a new post as a Consultant Ophthalmic Surgeon at Kingston Hospital NHS Foundation Trust. He practices privately at BMI Coombe Wing (at Kingston Hospital) and the New Victoria Hospital, Kingston. Mr Shanmuganathan's areas of sub-specialisation are cataract surgery, cornea and external eye disease. He also has extensive experience dealing with many common ophthalmic conditions. Modern small incision cataract surgery; Yag Laser Treatment; Corneal Surgery / Diseases; Pterygium Excision and Conjunctival Autografting; Eye - External Disorders; Corneal Infections (including conjunctivitis, keratitis and other contact lens related infections); Glaucoma; General ophthalmic conditions including lumps / bumps, cysts and chalazions around the eyelid; Dry Eyes and Blepharitis; Allergic Eye Disease. In addition to his clinical training, Mr Shanmuganathan has undertaken an extended period of research which culminated in the award of a PhD in Ophthalmology and Visual Sciences in 2008. Members should call 07841 114 805.